"The Jack Mulligan Fan Club"
Former United States champion Blackjack Mulligan returned to the Mid-Atlantic area in October 1977 after a lengthy tour of Japan and wanted his U.S. belt back. The only problem was his friend Ric Flair now had the title. But Mulligan asked for the match anyway and Jim Crockett was more than happy to oblige. 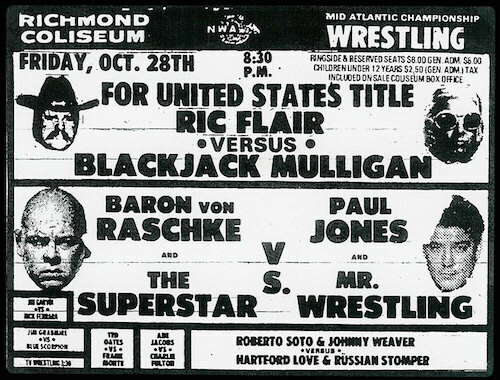 The match was set for Richmond, VA on Friday 10/28/77. 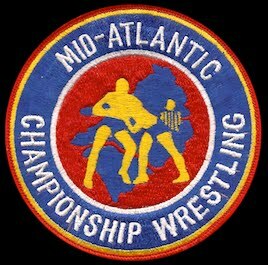 Fans couldn't believe that Mulligan and Flair were going to actually face each other. 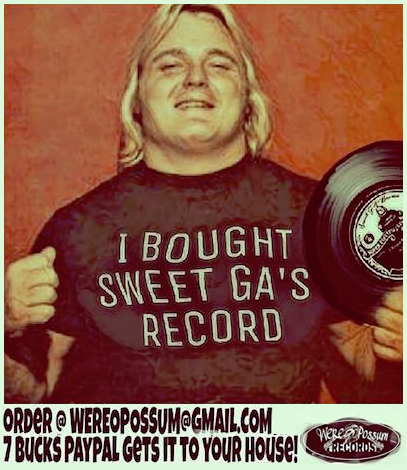 This was well before Blackjack's famous "babyface" turn in 1978 with the Hat and the Robe. 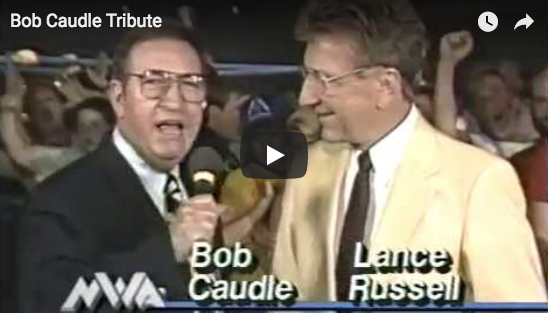 Take a listen to this sound clip of a classic promo from Blackjack, one of our favorites ever, as he addressed the situation in Richmond where fans were choosing up sides. The voice introducing Blackjack in the clip is "Wide World Wrestling" host Ed Capral. 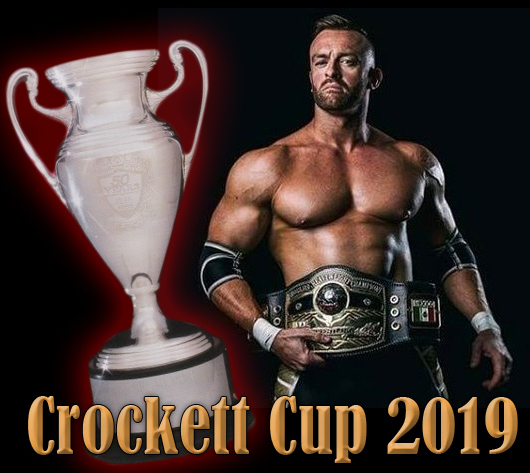 "I want to make one statement here now- - the Jack Mulligan Fan Club will be leaving on chartered buses from the Holiday Inn. Don't go to the Howard Johnson's because Flair's bunch is over there! Now everybody in town is choosing sides, don't get on the wrong bus and be a loser. Go to the Holiday Inn and get on the Mulligan bandwagon!" When Blackjack mentioned Richmond’s Holiday Inn and Howard Johnson’s in this local promo in October of 1977 promoting a dream match (that never actually occurred at that time!) 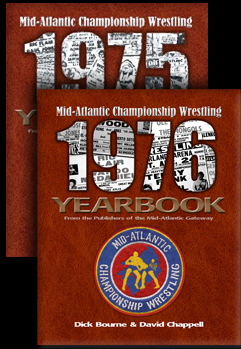 against Ric Flair, he brought up two landmarks that standout in Richmond’s Mid-Atlantic Championship Wrestling lore. Let’s take a quick tour of these places and the surrounding landscape. The Howard Johnson’s was for the most part the hotel where the wrestlers stayed when they were in Richmond. The hotel was located right off Interstate 95 on the Boulevard in Richmond, and is currently still operating as a Clarion Hotel. 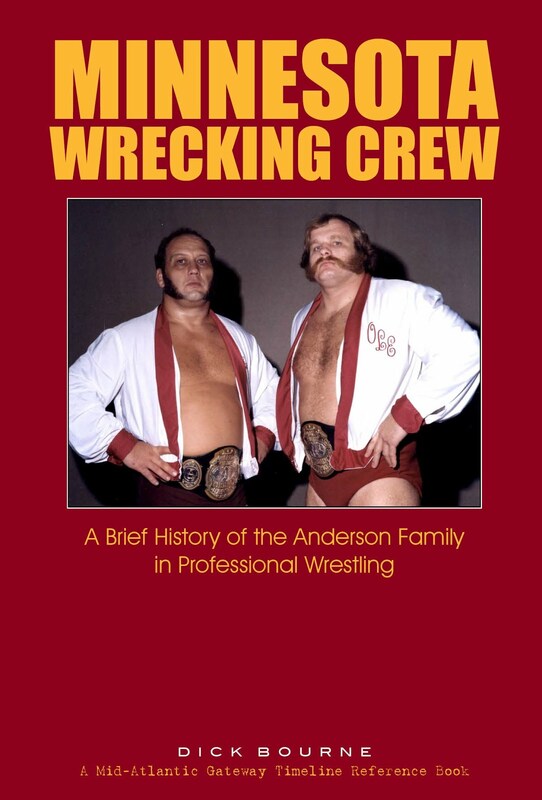 Richmond’s finest were very familiar with many of the characters that comprised the roster of Jim Crockett Promotions back in 1977, as numerous calls for service to the Howard Johnson’s will attest! Assault and battery, disorderly conduct, destruction of property and drunk in public were just a few of the allegations! I’m sure everything was merely playful…guys just want to have fun, right? The Howard Johnson’s was almost within eyeshot of the Richmond Arena, the veritable old edifice where many terrific Richmond Mid-Atlantic cards were held in the mid-1970’s. The Arena was torn down in 1997. Even closer to HoJo’s was Parker Field (now called the Diamond) where minor league baseball was played, and a where once in a blue moon Mid-Atlantic Wrestling cards were held in the summer months. About two miles south of the Howard Johnson’s on I-95 was the Richmond Coliseum, which is still operating today. The Coliseum was home to many mega-events in the Mid-Atlantic Championship Wrestling history of Richmond, Virginia. From the Howard Johnson’s, if you headed on North Boulevard for about a half mile towards Broad Street, you would run into a small Chinese restaurant called the Lotus. The Lotus still operates today. The Lotus was a popular eating place in Richmond for the Mid-Atlantic wrestlers, for two big reasons. The prices were cheap, and the place stayed open into the wee hours of the morning! And the staff knew the wrestlers, who had little to no problems with their occasional hijinks and shenanigans! From the Lotus, if you took a quick right turn onto West Broad Street from North Boulevard, you would see the Richmond Holiday Inn in about a half mile on your right. This landmark is still operating today as the Comfort Inn—Midtown. Back in 1977, the Holiday Inn was known principally for its bar/lounge/club, the Caesar’s Cellar! Flair, Mulligan and a host of other Jim Crockett Promotions stars were regular visitors of the Caesar’s Cellar, and many a Richmonder got a free drink there from the generosity of one “Nature Boy” Ric Flair! 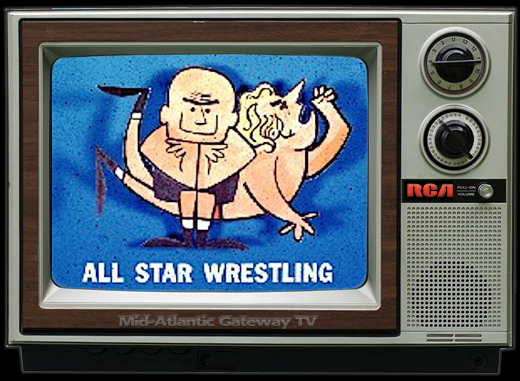 And as we wind up our Mid-Atlantic Championship Wrestling Richmond tour in the 1977 time capsule, almost directly across Broad Street from the Holiday Inn/Caesar’s Cellar you would see the television station that carried Mid-Atlantic Championship Wrestling (and later World Wide Wrestling), WTVR TV Channel 6. Today, Channel 6 still broadcasts out of this same building, though the size of the building and the size of the tower on site has grown with the passing years. Blackjack Mulligan returned to the area in October after about a two-month stay in Japan, getting his head together after dropping the U.S. 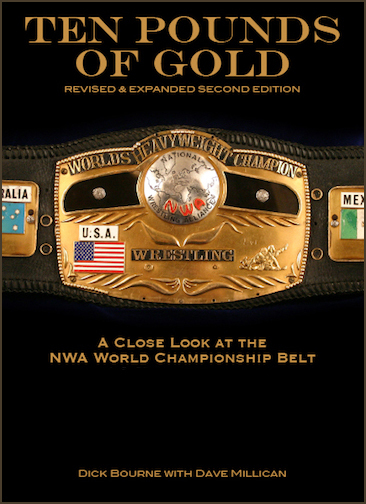 Title to Bobo Brazil. 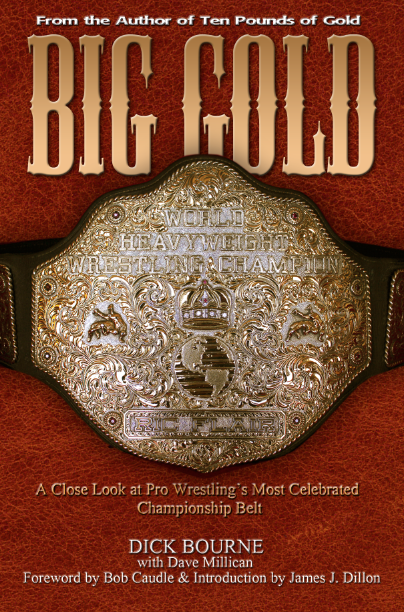 When Mulligan resurfaced on the October 22, 1977 edition of the Mid-Atlantic Championship Wrestling TV show, the big Texan said he had changed his style of wrestling and that he was going back after the U.S. Title now held by best friend Ric Flair! NO ONE could believe that Flair and Mulligan were actually going to wrestle each other for the U.S. belt!! But title matches between the two friends were set in many of the bigger arenas around the area. 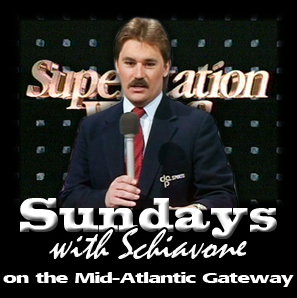 The interviews promoting these matches were amazing, with Mulligan doing his interviews with the "good guys." However, the matches between Flair and Mulligan that everyone was talking about, never came off. 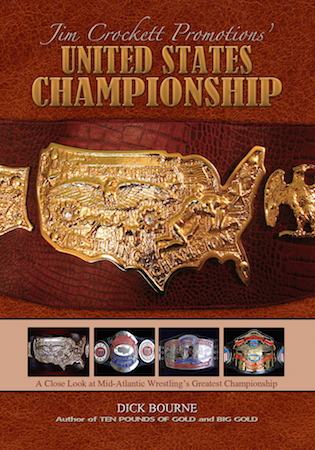 The very next week on Mid-Atlantic Championship Wrestling TV, Ricky Steamboat was announced as the new United States Heavyweight Champion and Steamboat had subbed for Flair in the Flair-Mulligan matches set during the previous week. 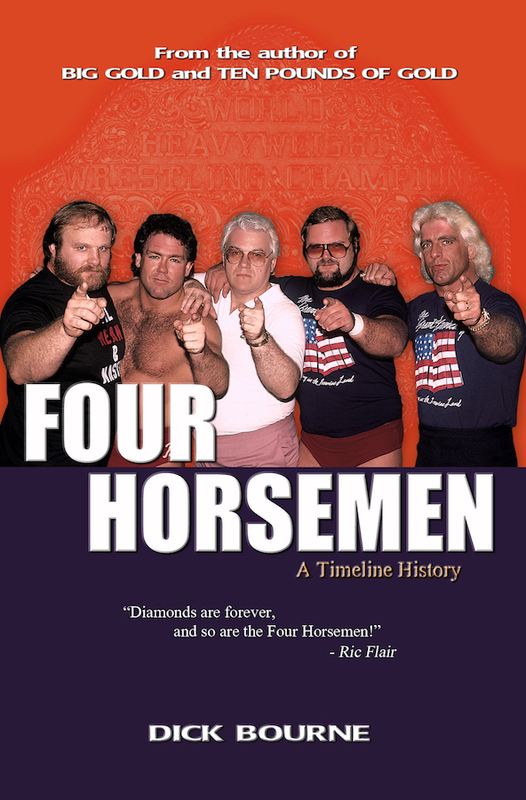 At the end of the show, Flair and Mulligan were interviewed together by Bob Caudle, with both saying that they were together again and that Ricky Steamboat was going to have to deal with their combined wrath.